Just look at the photos to see how engaged the students were! This term we are continuing our L3 activities focusing on reading, writing and comprehension. In our English unit this term we will be viewing texts on Australian animals and developing our understanding of how some aspects of stories may be inserted into other stories eg: comparing ‘The Cocky who cried Dingo’ to the classic story of ‘The Boy who cried Wolf’. During Maths this term, students will continue to develop their confidence with number sequences to 100 by ones from any starting point, identify the number before and after a given two-digit number, and read and use the ordinal names to at least ‘thirty-first’. Students will also be learning about half past the hour on analogue and digital clocks and comparing area and mass. TEN activities will continue with a focus on oral counting (forward and back) and numeral identification. This term Year 1 students will complete the Science unit ‘All Mixed Up’. Students will learn about materials that don’t mix well, and others that are difficult to separate. Through hands-on investigations, students will explore how changing the quantities of materials in a mixture can alter its properties and uses. This term students will be studying the History unit ‘Past and Present Family Life‘. They will learn about the similarities and differences in family life by comparing the present with the past. They will explore lives ‘in the past’, ‘today’ and ‘in the future’. Later in the term, Year 1 students will visit the Colonial Inn Museum to view local artefacts from the past. 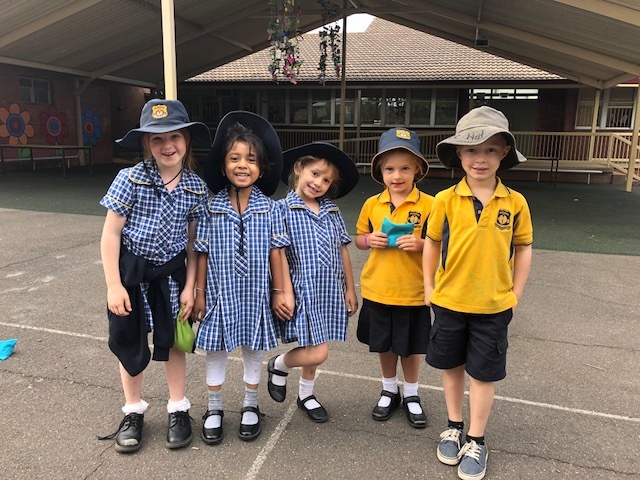 Sport for Term 3 will include the following games and activities: Newcomb Ball, T-Ball, Rugby, Yoga, Soccer, Dancing, Softball and Ball Games. Students will continue to develop their Fundamental Movement skills in daily P.E. with particular focus on balancing, running, jumping, skipping, and hopping. During weekly Bounce Back lessons students will be developing their skills and attitudes to become more resilient. Units covered this term will be on relationships and thinking for yourself. At the end of this term (Week 10) Stage 1 students will be putting on a performance based on the much loved story of the Rainbow Fish. Each class will develop a dance based around a sea creature. More information with dates and times will be sent home in the next few weeks. In Music, Mrs Warner will continue to teach Year 1 recorder. The theme for this year’s Rosby Sculptures in the Garden for Kids is ‘AIR – The wind beneath my wings”. Stage 1 classes will be working on a collaborative project. If families have any hula hoops or fabric/rope/twine they could donate to our project it would be much appreciated.